Last summer the Celtics rebuilt their roster and Sunday's 108-83 Game 1 win showed exactly why. Boston is now built to battle LeBron James. 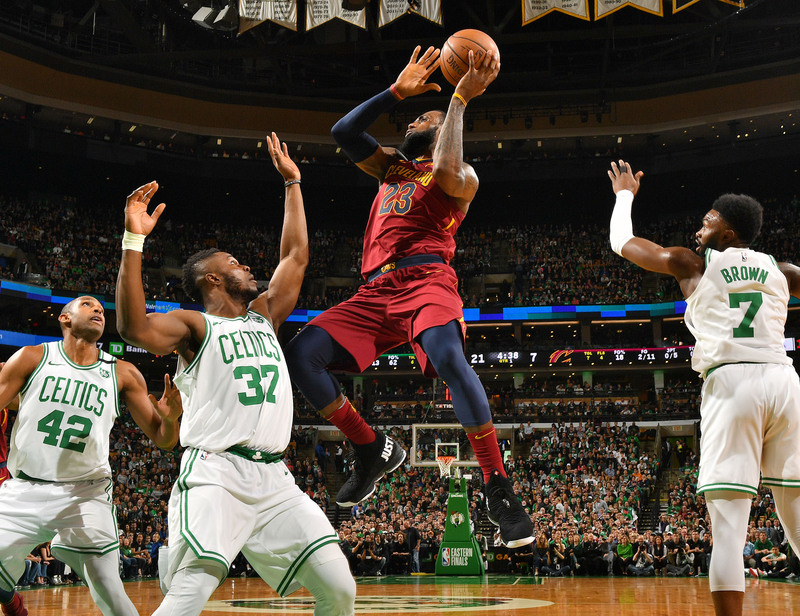 BOSTON — Almost exactly a year ago, LeBron James went into Boston and finished with 38 points, nine rebounds and seven assists in an easy 13-point Game 1 win. He was modest afterward, which made the whole performance even more disrespectful. He told TNT's Kristen Ledlow that it was a "feel-out game" after 10 days of rest for he and the Cavs. He promised her he'd be better in Game 2. At the podium LeBron added, "I don’t even think we played that great tonight. We definitely didn’t shoot the ball as well as we’re capable of shooting." And look, to LeBron's credit, he wasn't lying about any of this. The Cavs won Game 2 by 44 points two days later. But that script was flipped Sunday. After the Cavs stormed through East and right back to Boston, the Celtics scored 17 unanswered points to break the game open in the first quarter. LeBron never found a rhythm. Neither did Cleveland's shooters. James finished with 15 points and seven turnovers, while the Cavs went 4–26 from three-point range. Boston was up 28 points when Ty Lue waived the white flag on Cleveland's 108–83 loss and his starters checked out of the game in the fourth quarter. There were many dynamics in Game 1 that may or may not continue through the rest of the series. It's dangerous for anyone to draw too many conclusions after one game of a playoff series, particularly with the best player of the past 20 years sitting right there like Chekhov's GOAT. As Brad Stevens said afterward, "You just have to keep making it as hard as possible on LeBron. He's obviously not going to have many games like that. Their shooters around him won't have many games like that." But one thing is already clear: this year's Celtics are not last year's Celtics. Only four players remain from last year's roster. And for all the factors that explained the turnover in Boston last summer—Isaiah Thomas's hip complicated his future, salary concerns made Avery Bradley untenable long-term—it isn't an accident that the team assembled in the past 12 months is suddenly equipped with several different solutions to the LeBron problem. When this summer's upheaval gave the Celtics front office a chance to build something new, they built smarter. The modern NBA belongs to players who can do everything. On offense that means players who can shoot threes, make plays for others, finish inside. On defense it's guys who can stick with guards after a pick-and-roll on the perimeter, and hang with forwards on a switch in the post. Mostly, these players are either athletic and long with wiry strength, capable of covering crazy amounts of ground (Kevin Durant), or they are big and strong, but with enough foot speed to stay comfortable in space (Draymond Green). Last season's Celtics had a few players who fit that description—Al Horford, Jae Crowder, Marcus Smart, and sometimes Jaylen Brown or Kelly Olynyk—but there were others who could be hunted for mismatches. Isaiah Thomas was a glaring defensive liability in every lineup Boston played in the postseason. Avery Bradley was an incredible on-ball defender, but he was only 6'3", and that complicated his value in a switching defense. Players like LeBron or Kevin Love could get whatever they wanted against him. Even Crowder, while better than many of his teammates, was a step slow guarding the best wings in the league. And they all got exposed against the Cavs. Now look at this year's roster. Jaylen Brown has improved on both ends of the floor and he's become consistently excellent. Jayson Tatum was drafted to provide additional length on the wing, and he's already better than even the wildest optimists could've imagined. Semi Ojeleye was another wing added from the draft, and he was starting and guarding Giannis Antetokounmpo in the first round of the playoffs. Marcus Smart is 6'3" and still capable of guarding anyone from a power forward to a point guard. Al Horford just spent the second round alternating between guarding Joel Embiid and Ben Simmons. Aron Baynes can hold his own on the perimeter and bang with any big man in the league. Terry Rozier has grown into one of the best defensive point guards in the NBA, and he's got the length and quickness to bother most wings. Marcus Morris arrived in the Bradley trade, and he spent Sunday bumping LeBron with strength and matching him step-for-step with speed, somehow holding his own. It certainly helps that every Boston team under Brad Stevens and Danny Ainge has been both impeccably disciplined and chippy as hell. "We have a lot of guys that really just don’t care," Marcus Smart said of Boston's approach Sunday. "Playing LeBron and that Cavs team is great—they’ve been here for a reason. We have talent as well. We’re fearless." The difference this season is that all of that energy—chippy discipline? disciplined chippiness?—can be channeled into something much tougher to counter. There was no defensive weakness on the floor for Boston on Sunday. No mismatch to hunt. And LeBron was slowed down by Morris, but he was also pickpocketed by Smart, while his post-ups were consistently complicated by weakside help from Brown, Horford, and Tatum. It looked exhausting. Every time Cleveland had a mismatch, there was a 6'8" Celtics wing sliding in from the weakside to erase the advantage. "Brad and the coaching staff did a great job in Game 1," James said afterward. "You commend that. We have an opportunity to look at a lot of film tomorrow, and see ways they were making us uncomfortable, making myself off balance and not have a rhythm all game. So we'll be much better in Game 2." It's LeBron James, so, again, he's probably not lying. This series will get closer. The Cavs will shoot better, while Boston's offense—51.2% FG, 35.6% 3FG in Game 1—should come back to earth. It still seems unlikely that Marcus Morris will be an effective LeBron Stopper for an entire series, or even four games. But it's also important to appreciate exactly what's happening here. Sunday was about more than sorcery from Brad Stevens and Marcus Smart's lack of fear. On a structural level, this roster has been built to harass stars like LeBron James. We just watched them do the same thing to Ben Simmons and Joel Embiid for two weeks. So much of this Boston season has been defined by who the Celtics are missing (Gordon Hayward and Kyrie Irving) and what's possible when everyone is healthy next season. That's fair. For one thing, the offensive firepower the Celtics lost to injuries will ultimately be why they lose in either this round or the NBA Finals. But if the topic is next season, the focus on returning stars obscures what makes this team particularly dangerous. Once the Celtics recognized they couldn't compete with the top of the NBA, what they built instead was a group of eight different players with the length and athleticism to chase teams all over the floor. They all play smart under Stevens, and they work extremely hard, with no fear. Next season there will be more scoring and more depth, but most of the wins should look a lot like Game 1 Sunday. Everything that will make the Celtics great is already here.